...Enjoy...and dont forget to help out less fortunate children, all you need to do is check my other deviantion under this link : [link] and follow the instruction in the description, all it cost you is a single click and it really is for a great cause so i hope i can count on you . This feels like a design choice for smash bros if Mario wasn't a popular character. 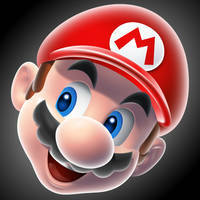 This is honestly the best representation of Mario ive ever seen. Much better than what he looks like these days. Not that it's bad, just your's is better as it sticks closer to his Brooklyn plumber roots. So that's how he would have looked in today's graphics. I love the one in the middle. Good job, bro! can you do luigi pls. What an outstanding redesign ! I want it on my TV set ! Please, can you please do one of these for Luigi? I'm begging you! Can i use the small sprite, but not the big mario, and sorry i kind of started to use it, I dont want to get you mad so are you cleared up with this? Not everyone has to But i agree with mariomariooaqw, it would be more helpful to know what exactly you didn't liked bout this one . oh I was younger when I saw. Now I see that's cool, know... hehehehe Seriously. Want to see my drawings? Ive already seen your drawings neat stuff, but since you are so much into Pokemon, how bout you try to create some yourself...that's something ive always loved to do when i was drawing Pokemon, instead of drawing Pikachu or Charmander...maybe draw a Fire element Pikachu version or Electric Charmander...or a completely new Pokemon. mmmmmmmmmmmhhhhh understand... But sincerely I don't know creating stuff sorry. Every time I try it goes wrong. You don't get good instantly, but by trying and trying till your work meets your own standards, so don't discourage yourself even when your work doesn't look as good as you wish. You don't have to worry. I'm brazillian and I just don't like your drawings. But I can like your other drawings. You basically made Classic Mario new again! ...It would be cool if Nintendo or someone else made a modern remake of the original Super Mario(Mario,I did RESEARCH on the name xD,Super Mario Bros film adaption AND "Dr.Mario") video games with this version of Mario. Very nice redesign. I'd love to see a Paper Mario game giving him this appearance. This is awesome. I love this recreation. Now that is what I call *Evolution* I love what you did there! 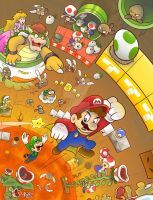 Red/Blue is more popular set of colors, most Iconic characters wear red/blue, Superman, Spiderman, Captain America...so i understand why they changed it...its just, washed up green makes mario look a little more...well, Plumber'ish. That makes everything clear to me now. I guess that's why SEGA's Sonic the Hedgehog is Blue and Mario is Red and Blue. Thank you for clearing that up!